Women's Indira Active workout and yoga clothing for sale online in a variety of styles including leggings and bras. Indira Active MAGGIE High Waisted Leggings: Mirror, mirror, on the wall. Whoâ€™s the fairest legging of them all? Why itâ€™s the MAGGIE. Get ready to turn your workout upside downward dog in this high-waisted, over-the-foot legging. Covered in a hypnotic red-and-white kaleidoscope print, itâ€™s time to take these compression sports tights for a spin. Indira Active AERIAL Bra Top: in choice of WHITE or BLACK. Indira Active UNITY Cross Strap Top: This short sleeve tee with cross back strap details will up your game during all your workout regimes. Indira Active LEOPARD HEART Leggings: These leopard printed leggings with mesh panel details will really add heart to your workouts. Indira Active ANANDI Bandage Leggings: Unleash your inner tiny dancer in these ballet-inspired bandage leggings. Available in classic black, or an earthy olive, these full-length leggings will make you stand out at the barre. Indira Active BECKY Sports Bra: This pretty push up sports bra with patchwork color details is a must-have for your athleisure wear collection. Available in choice of GREEN, PINK, BLACK, or BLUE. Indira Active MALEE High Waisted Floral Leggings: Did you know that the secret to a longer leaner leg is a high- waisted, printed legging? Covered in black and white flowers and with mesh details running along the length of each side, the Malee is about to become your new BFF. Indira Active ENERGY 2.0 Strappy Back Bra: Business in the front, and a party in the back. Inspired by the intricate hand knotting techniques known as macrame and crochet, the Energy Bra was created to be supportive, functional, and show-stopping. With a minimalistic, smooth scoop neck front and an ultra-strappy back, this versatile style not only looks impressive but offers sturdy support for all levels of training. Indira Active VANESSA CAMO SWEATPANTS: Ultimate comfy cool - vintage camo print sweatpants. Drawstring waist and elastic cuff. Ankle length. MARISSA LACE UP CAMO PULLOVER TOP: Strike that perfect athleisure balance in this lace-up sweatshirt in a soft cotton blend fleece french terry. Indira Active STARBURST DRESS: The ultimate showstopper, this mid-length marvel will take you to the next level. With stunning back detail and the sweetest sweetheart neckline, it's designed to help you shine. 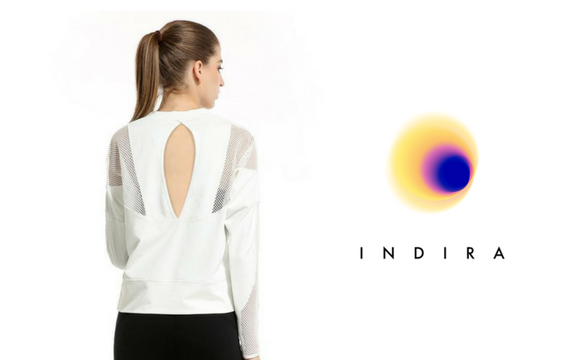 Indira Active HONOUR OPEN BACK BODYSUIT: The ultimate day-to-night bodysuit, a mesh panel at the upper back and open lower back detail keep you cool while looking hot! Blur the boundaries between fashion and studio in this trendy, fitted item showcasing a high neckline with zipper and supportive paneling, strategically placed to enhance the feminine form. Delivering unrestricted freedom of movement, dance yourself happy in this multitasking item or wear as a form fitting base layer for your next night out. Indira Active DHARA Dress: Stand out in this oh-so-flowy maxi dress. Soft, yet supportive fabric and an empire waist will make you feel like the goddess you are. Walking on air has never been so easy. Indira Active TRI COLOR LEGGINGS: With clean lines and a sleek look, the high waist tri-color legging remains a perfect go-to option when you just need a leisure day. Not only is this legging stylish, it's practical with side mesh inserts are designed to keep your body cool and dry, no matter your activity level. Plus, its high waist provides you added core support. More women's activewear styles at Indira Active Official Store.